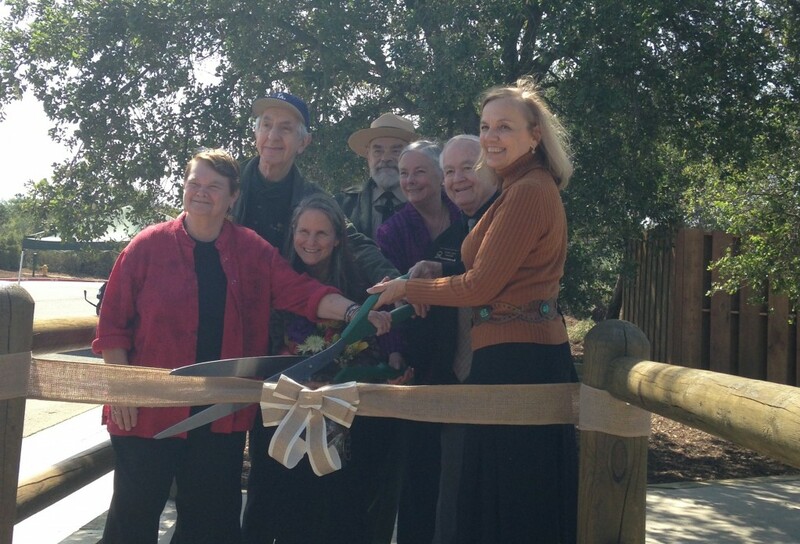 Sheila Kuehl, Jerry Daniels, Liza Braude-Glidden, Joe Edmiston, Fran Pavley, George Lange, and Cindy Miscikowski cut the ribbon at the re-dedication of Marvin Braude Gateway Park. On Friday, April 3, representatives of CORBA and Girls Gone Riding joined a plethora of politicians and other members of the public to rededicate Marvin Braude Gateway Park at the top of Reseda Boulevard in Tarzana. Honored guests included LA County Supervisor Sheila Kuehl, California Senator Fran Pavley, former LA City Councilwoman Cindi Miscikowski and Marvin Braude’s daughter Liza Braude-Glidden. In the 60’s, there was a plan to build a Reseda to the Sea Freeway and a cross mountain freeway along Mulholland. Speakers recounted Braude’s commitment to preventing this and his 1964 plan to have the City of LA save the Santa Monica Mountains by creating a park district and buying the undeveloped land. When he was rebuffed by the City Council, he ran for office, won and began his distinguished career as an advocate for the Santa Monica Mountains and other health and environmental issues. 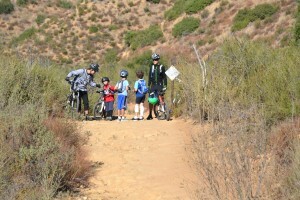 The park, one of the main trailheads for mountain bicyclists and hikers coming from the San Fernando Valley was built 20 years ago when advocates and land mangers worked to stop plans to connect Reseda Boulevard and pave sections of Dirt Mulholland. Braude Park has recently been refurbished by the Mountains Recreation and Conservation Authority. ADA facilities have been improved, there’s a new bathroom and drinking fountain, and interpretive panels have been installed. Joe Edmiston , Executive Director of the Santa Monica Mountains Conservancy and chief Operating Officer of the MRCA hosted the event and specifically thanked CORBA for its contributions to the park and trails community in his remarks. The proposal drew lots of public input last May when it first came before the council after a series of public workshops earlier in the year that drew around 40 people each. Several speakers opposed the additional access for bikers, causing the council to reconsider the issue until after the summer. The original trails use plan for most of the 1,400-acre nature preserve went into effect in 2009 after a nearly two-year process led by a committee of citizens and public officials. Now the non-profit Palos Verdes Peninsula Nature Conservancy, which oversees the property, wants to designate trails on a remaining 190-acre portion known as Filiorum. The opportunity also opened the door to revise the existing trails plan on the rest of the preserve, said Danielle LeFer, conservation director. 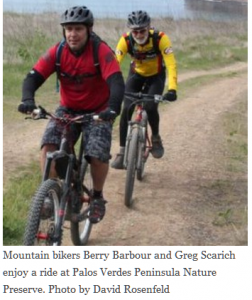 In all, mountain bikers will potentially regain access to two trails in the Portuguese Bend area and four trails in the Abalone Cove area. When the issue comes back to the council next month, little will have changed from what was presented in May, said Ara Mihranian, deputy director of community development for RPV. “There are other groups out there that have their own agendas who are asking the council to make changes, but that’s not what’s being recommended by staff,” Mihranian said. Long-time mountain biker Troy Braswell said he’s concerned the council could reverse a lot of the hard work accomplished in 2009. But council member Susan Brooks said that’s not the case. The council postponed its decision so it could become more familiar with the preserve, Brooks said. Brooks said RPV bears the burden of managing all the parks on the peninsula with no additional funding aside from city coffers. By designating the trails, conservationists hope to limit impacts to the natural terrain as well as conflicts with different users. Since June 18, a ranger hotline received 55 calls, mostly about off-leash dogs said Katie Howe, parks and recreation administrative assistant. “It’s helping to keep us aware of what’s going on in the preserve,” Howe said. So far no calls have come in with conflicts regarding horses or mountain bikers, Howe said. Gordon Leon, who formerly chaired the city’s equestrian committee, said the trails plan has worked pretty well. 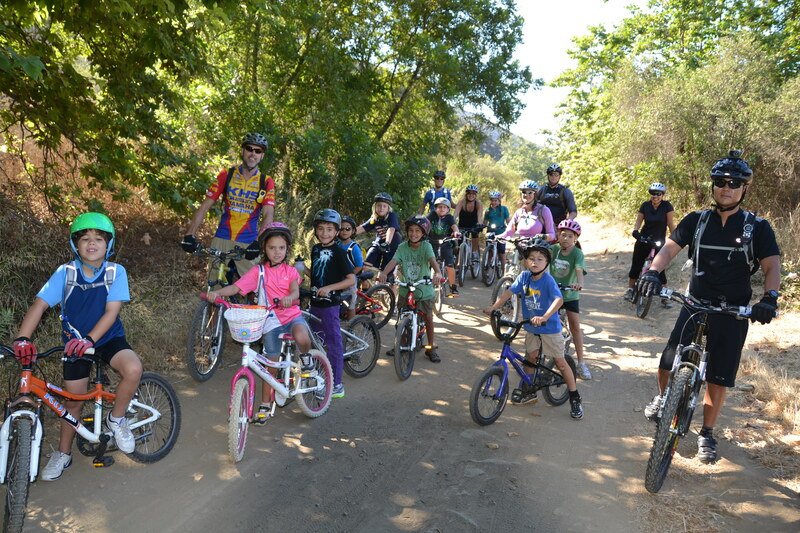 On Saturday September 3rd, the CORBA Kids Club rode again with several new riders and a lot of excitement to see each other again after our last big ride in June. Dave reviewed trail ettiquette and safety tips with everybody, we welcomed the newcomers, set our walkie-talkies, and then all 17 riders saddled up and headed out. It was the club’s second time at Sycamore Canyon/Point Magu, which was the perfect place to avoid the heat. Adult riders were Joy, David, Dave, Suzy, John, Kat, and Lorenz. Kid riders were RJ, William, Julia, Nolan, Sean, Natalie, Ethan, Josiah, Emma, and Simon. Larry and youngest son, Elliot, cheered us on and took photographs (see the photo gallery of this ride). There was a surprising amount of poisen oak along the sides of the trail. Kat pointed it out to the new riders, and made sure everybody was careful not to put their bikes into it while waiting for the others to catch up. All but two of the water crossing were completely dry, and most kids completed them with no problems. We took our first break where the kids used the facilities, ate their snacks, and climbed a downed tree. At the end of the ride, several adults and kids played in the beach cove, while Dave readied the BBQ, and cooked everyone lunch. After lunch and snacks, we reluctantly broke up the party. We hope you will join us next month for the IMBA’s annual Take A Kid Mountain Biking Day at Malibu Creek State Park. Meet at the upper parking lot 9 a.m. Different ride options will be available, and a free BBQ lunch will be served. The CORBA Kids Club had another successful fun ride Sunday March 6 in Malibu Creek State Park. We met in the lower parking lot because the upper lot was full due to the marathon. We scouted around the upper lot looking for additional participants, and by 9:30 we began our ride. 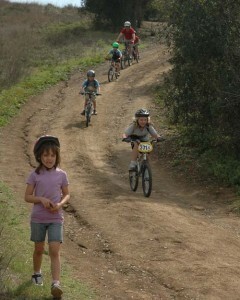 We started with a mini skills clinic, reviewing the importance of speed control, body positioning, and trail etiquette. The adults demonstrated descending the stairs, and those kids who were comfortable doing so also gave it a try. A few of them wanted to do it again and again. 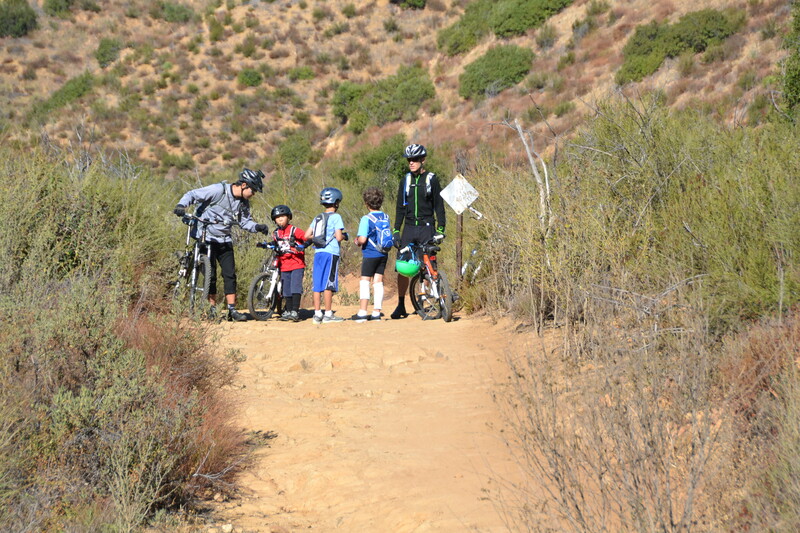 One at a time, we walked the bikes and the kids across Mulholland where we resumed our ride on the North Grasslands Trail. While riding the single track Grasslands Trail, we saw a member of the Equestrian MVP. The kids knew to go off to the side and let the horse pass, and the rider complimented us on our trail etiquette. We continued past the power station and determined our turn-around point shortly thereafter. On the way back, We stopped at the trail leading to the water tower, so the kids could hike up to it and enjoy the views. Two adults were with the kids at all times and the other adults watched the bikes. We then rode back to the cars, while some Turkey Vultures hovered overhead. The two vultures actually landed on the grass near the parking lot, and then took off again, so kids and adults got to see their wing span as they took flight. You can view the photo gallery for this ride. Our next ride is scheduled for Saturday April 2. Meet at Cheeseboro Canyon in the upper parking lot. Hope to see you there! Mountain Bike Component of LA Bike Plan In Jeopardy! Anyone interested in riding their bicycle off-pavement in any Los Angeles City Park needs to be at the Los Angeles City Council Meeting this Tuesday March 1. According to sources close to the City Council, the mountain bike feasibility study is about to get stripped out of the bike plan. City Council member Tom LaBonge wants to introduce last minute motion to send the Bicycle Plan back to the Transportation Committee for “revision” (read removal?) before passing the plan by full council. If you can’t attend the meeting then we encourage you to call La Bonge’s office at (213) 485-3337 or email at councilmember.labonge@lacity.org to share your opinion on LA Bike Plan. Also make sure to let your city Councilperson know too. This is your city! This is your community! Get involved or lose opportunities to ride dirt in LA. Click here to find your City Councilperson. 1. Mountain bicyclists have participated in good faith in the entire planning process. 3. It requires the city to look at the experience and practices of other cities and of neighboring open space land managers. 4. It requires an inventory of city dirt roads and trails. 6. Mountain biking is a safe, sustainable, health promoting activity. 7. Among the three purposes of the bike plan are: Increase the number and type of bicyclists in the city and Make the City of Los Angeles a Bike Friendly community. The studies of mountain biking on trails are totally appropriate with those goals. 8. To pull this language now is unwarranted. 9. The plan has been vetted. The time to pass it as drafted is NOW.